I had an office job where we had an ID card that we had to swipe when we left and returned from lunch. It seemed like a silly nitpicky kind of thing to keep track of since we were on salary and worked 50-60 hours a week. Nevertheless it would be brought up and used against you in reviews if they thought your breaks were too long. Then one day without explanation, the machine was gone and we never had to keep track of our time again. The coffee cup seems to be happy to help! 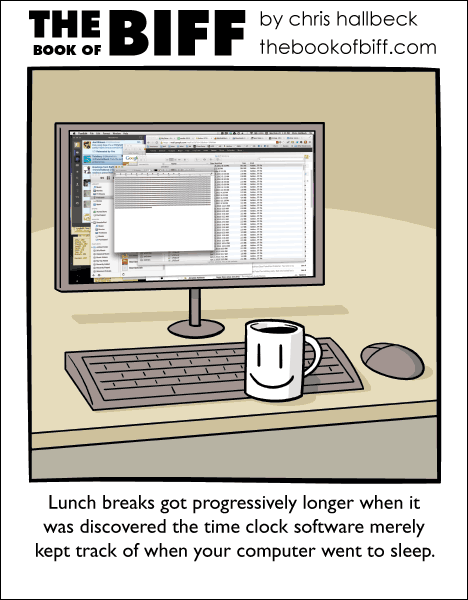 I bet the time cards seemed like a good idea until it started to show the real time-wasters were with the guys who brought in the system. Somebody probably brought up that since you were tracking hours, you should get OT for the extra hours worked. Dept o’ Labor is picky about those things. I think they have to show proof to the state that you took a full lunch.